Special Olympics Area 3 competes with ACC. Michigan — March 21st marks world down syndrome day. A day for people to show their support. One trend is to wear mismatched socks, but the Alpena Community College showed their support with a very unique basketball game. 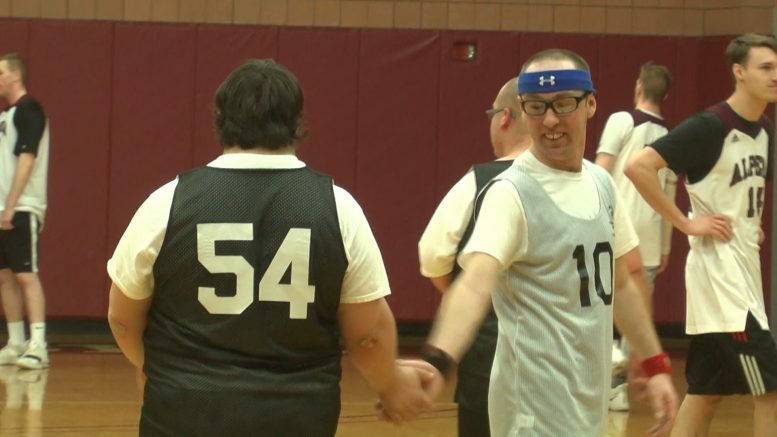 Park Arena in Alpena is home to the Lumberjacks, but this time they shared the floor with Special Olympics for the 17th time. “I like it. I’m going to do it again,” said Brian Psenski. ACC freshman guard Tylor Ross enjoyed taking the court and meeting new friends, but there was one familiar face. This game was especially fun for state competitors like Psenski. We asked him what he thought about the Lumberjacks. A little trash talk right there, but that’s part of what made this game fun. Trash talk aside, the athletes made some tough buckets. The impact play of the game occurred when Lumberjack’s Oliver Rice orchestrated the floor, bounce passed to Nick Stephan down low and he scored. The crowd went wild. For the ACC athletes this was a once in a lifetime opportunity that they will never forget.